Product #719 | SKU 2010-014-247 | 0.0 (no ratings yet) Thanks for your rating! 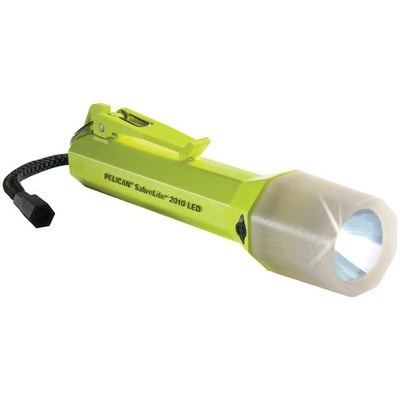 The Pelican 2010PL SabreLite with Photoluminescent Shroud (Yellow) from Pelican produces 109 lumens of white collimated beam that's as bright as an incandescent flashlight and provides 10,000 hours of lamp life and a 32 hour battery burn time. Its maximum beam distance is 144m and peak beam intensity is 5189 candelas. This Sabrelite has an ABS resin body with a twist on/off lens shroud that eliminates accidental discharge and is submersible to 3.28' (1.0m) for a duration of 30 min. Features including a belt/shirt clip and lanyard make the light ideal for industrial, recreational, and home use.